Struck down by an angry god. “Zeus isn’t real,” my daughter confided one day when she was four. “Yesterday I told a lie on purpose and swore by Zeus.” Swearing by Zeus was fashionable among her older sister’s Percy Jackson-obsessed friends. “And I didn’t get hit by lightning. Zeus isn’t real,” she concluded. Fortunately, in a story that sounds apocryphal, Giuseppe Verdi’s lightning test led to a different conclusion regarding divine power. Thus the world was gifted with Nabucco, Verdi’s exquisite version of King Lear set amidst the destruction of the First Temple in Jerusalem. In opera, historical inaccuracy is practically a virtue. Thus Zaccaria is moved forward a couple centuries to experience the events predicted by his historical counterpart. Nabucco (aka Nebuchadnezzar) is given two daughters, the favored Fenena who turns against him out of love for the Jew Ismael, and Abigaille, who turns against him out of hate and anger. I feel like Verdi has a better grasp of the principles of storytelling than most operatic composers. Most opera characters have the depth of those cardboard cutouts that stand in the lobbies of movie theaters. But every character in Nabucco has their own story arc; they deal with divided loyalties and evolving belief systems. When Nabucco is struck down by an angry god for his hubris (not a spoiler) the only thing that tells the audience whether that god is Jehovah or Baal is its own faith. During his subsequent madness Nabucco acts more rationally than at any other time in the story. No textbook of Verdi’s time described it, but Abigaille presents with a textbook case of clinical depression. It is only when he is no longer concerned with his own power that Nabucco is able to see Abigaille’s misery; his behavior is most rational while he is deemed mad. In fact, there was so much going on that the characters’ internal struggles tended to be more academic than felt, leaving the chorus to bring most of the emotion. Usually the big third act choral endings strike me as more loud than meaningful. But in Nabucco the chorus gets some of the sweetest music. Just listen to Va pensiero below. Even as the characters are complex, this early-Verdi opera features some of the most acrobatic singing ever to grace a stage. Rumor has it that more one diva has blown out her voice in the role of Abigaille. Rafaella Angeletti sang that role beautifully on the day I attended. I can only imagine how wild the audience must have been on the days Seattle’s favorite golden girl Mary Elizabeth Williams sang. I was thrilled by the bass-baritone Zaccaria, sung on the day I attended by Andreas Bauer with more range, feeling, and dynamism than I thought possible for a bass. But really, the vocal fireworks were spectacular all round. 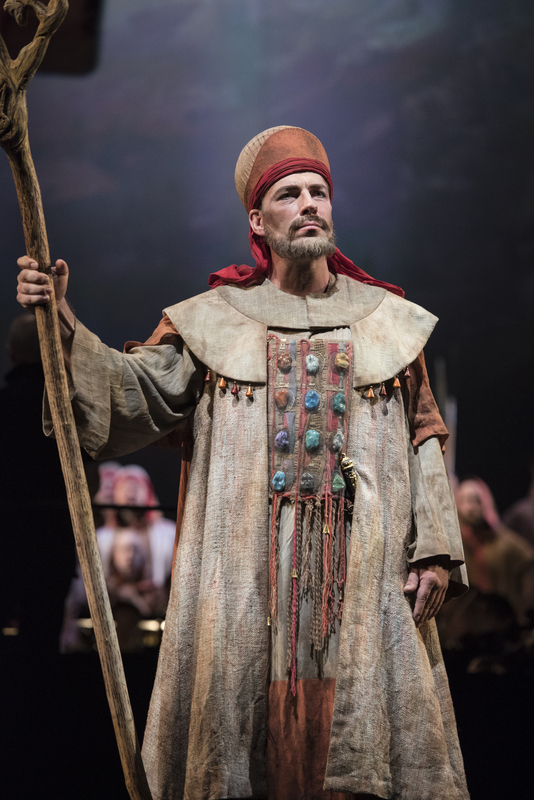 Nabucco is a new addition to Seattle Opera’s repertoire, and the production is, as usual, one of the most interesting things about it. 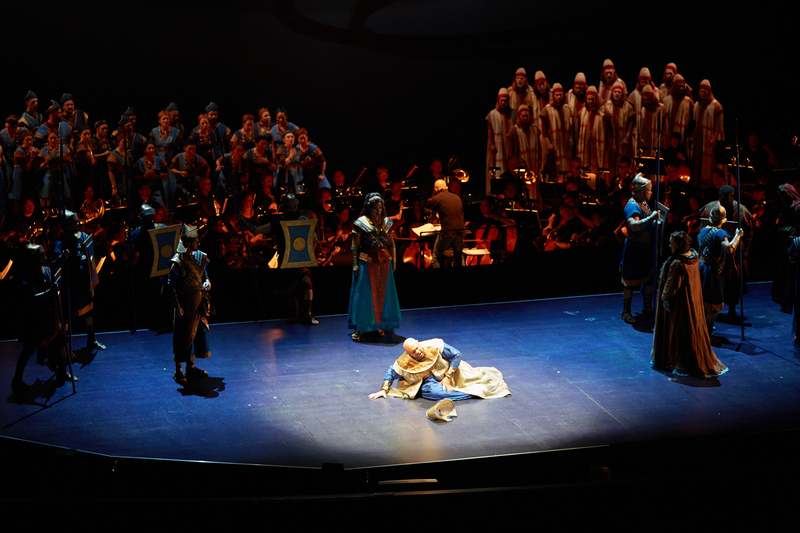 In order to protect the singers’ voices, Seattle Opera built the stage out over the orchestra pit, bringing the singers closer to the audience. With the pit capped, the orchestra then moved onstage. The chorus, and sometimes the action, took place behind the orchestra, while the primary scenes took place on the built out part of the stage. This made everything easier to hear, brought the action forward, and increased the energy of the performance, but it also left no room for scenery. Seattle Opera has experimented with digital projections before, but I think this is the first time that they have relied on them entirely for the sets. It was the best, and honestly, the only option with the reworked staging. But the actual images were so abstract that I found them distracting. Were the Jews supposed to be hiding in a cave or in the Temple? Is that a stalactite or falling masonry? Why is there half a statue of a horse floating above everything? These questions drew me away from the story. As the opera progressed, either the images became more straightforward, or I adjusted to their symbol language, because the disintegrating statue of Baal was very effective. The royal blue geometric designs of the Babylonians immediately communicated their rigid foreign culture while the dusty flowing robes of the Jews conformed to our Hollywood-trained expectations for them. 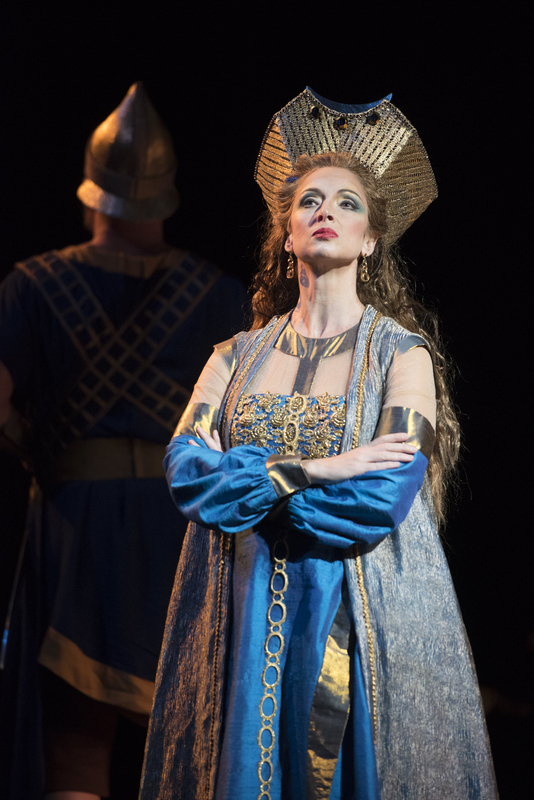 I loved how Abigaille looked wearing Nabucco’s crown, when it was just a funny hat on him. But Fenena looked like a bel canto soprano in her pale blue gown. Of course, she was a bel canto soprano. Beautiful as it is, the music sometimes felt as incongruous as Fenena’s dress. I craved some kind of sonic signal to root the story in its respective cultures. Of course opera, like Shakespeare, usually operates outside of place and time, despite any nominal settings. It made me think about audience expectations. We want accents in English movies when the characters would have been speaking another language, which makes even less sense than writing ancient Hebrew as bel canto. Sometimes I go to the opera with a friend and half wish I was alone, the better to concentrate on the experience. This time I went alone, and wished I was with a friend. I ached to talk about all the ideas and impressions Nabucco sparked. There was just so much to think about. Nabucco doesn’t have the emotional impact of an opera like Tosca, but it is an amazing creation offering rich intellectual fodder for coffee-fueled post-performance discussions lasting late into the night. This entry was posted in Music, Seattle and tagged Andreas Bauer, Nabucco, opera, Rafaella Angeletti, Seattle Opera, Verdi. Bookmark the permalink.